There is a dichotomy surrounding bread, and this is especially true in the United States. Cultures all across the globe consume ground grains in some form or another, whether as bread, pita, naan, masa, or rice paper. Because of this, we often think of bread as something so essential that it is just there—on the table of a restaurant, in the basket of a kitchen, as the unquestionable cornerstone of a meal. But by expecting this of our bread, we also discount its true value. Bread isn’t just the food you eat while you wait for your ‘real’ meal to arrive; at its core, bread is one of the most human expressions of fundamental nourishment. In the US, commercialized bread dates back to 1849, when Boudin Bakery first opened its doors in San Francisco and began selling sourdough using a starter borrowed from local gold miners, a starter that, over 169 years later, still serves as the base for all Boudin sourdough loaves. Nearly 80 years later, thanks to the advent of commercially-produced yeast and Harvard chemist Eben Horsford’s recipe for baking powder, the Chillicothe Baking company in Missouri became the first bakery ever to sell pre-sliced bread. By 1931, Wonder Bread took the scene and quickly became America’s first nationally-distributed sliced bread, bringing with it a new source of fast and cheap food for families across the country. What does bread look like now? Well, it’s a mix. Over the last one hundred years, bread has undergone an incredible industrialization that has made mass-produced bread products widely and inexpensively available to all consumers. While today this wide availability of bread may seem something to boast about, the rapid industrialization of growing processes also brings with it the pressing issue of sustainability. According to a recent study from the Grantham Centre for Sustainable Futures at the University of Sheffield, in which researchers tested the environmental impact of one loaf of store-bought bread, the use of ammonium nitrate fertilizer contributed 43 percent of greenhouse gas emissions. Ammonium nitrate is a synthetic form of nitrogen that can be easily absorbed by plants. However, industrial agriculture’s excessive reliance on this plentiful, artificial source of nitrogen opens up avenues for many long-term environmental liabilities: namely the destruction of soil's original organic matter, as well as the seeping of excess nitrogen into streams, rivers, and oceans, eventually feeding massive algae blooms that suffocate sea life. It is in large part due to these concerns that the industrialization of bread, and of food in general, has been met with equally fast-growing resurgence of artisanal, small-batch food production processes, which culminated in the farm-to-table movement of the ’70s and ’80s. These chefs and bakers believe they are rediscovering the art of food, real food made from minimally refined ingredients using methods that date back to a time when cooking was, at its essence, an articulation of what made us human. Not only did these growing practices promote a more harmonious relationship with the earth from which we were taking, but the act of cooking also became the unavoidable time of day when we needed to stop and slow down, gather together and make a ceremony of our nourishment. While much has changed in our pace of life today, bread has the potential to be an intersection of these two ideas. Unlike the high price tag of raising sustainable meat, the cost of locally-sourced, organic grains to produce bread comes in at 10 cents a pound. Compared to the $6.50 per pound it costs to buy organic beef, bread is a far more accessible starting point to reintroduce the widespread consumption of whole, artisanal foods in the country. One pioneer on the bread frontier today is Lynn Williams, wife of Jim Williams and co-owner of their family business Seven Stars Bakery. The epicenter of their bakery’s production process is nestled in the Hope Artiste Village in Pawtucket, Rhode Island, a massive mill building turned lively community space. Inside the bakery, the air is hot and rich with the smell of yeast and proving croissant dough, which is raw and has been set in temperature-controlled lockers to ferment before being baked in order to ensure a full and fluffy croissant comes out of the oven. Lynn and her husband started Seven Stars Bakery in 2001, after spending their twenties cooking along California’s coastline. Jim grew up in the city of Orange, and when he graduated from San Diego State with a degree in English, he had, as Lynn puts it, a “What The Hell Am I Going To Do With My Life” moment. All he knew was that he was passionate about two things—beer and bread. So he did the only reasonable thing he could think of and dove head-first into the world of yeast. More specifically, this world of yeast meant the sphere of bread-making, an industry that had been experiencing an artisan revival since the 1980s, when Steve Sullivan opened Acme Bread Company in Berkeley, CA and became the champion of a return to the use of natural leaveners and wood-fire ovens. Lynn smiles. “I always kind of knew I was going to open a bakery.” Lynn has a particular glow about her; she’s a free spirit who exudes a fundamental joie de vivre. It’s contagious. She walks through the bakery where young employees mix a sourdough and fold kalamatas into the beginnings of rustic olive loaves. She slows when she reaches Jim. He is crouched in a back corner of the space mixing a small batch of brioche for his line of “Back Door Bread” that he’s been selling out of Seven Stars’ office front every Saturday during this year’s Pawtucket Wintertime Farmers Market. When I ask him about the dough, he hardly looks up. It’s clear that this is what he loves about bread—the back of house, the getting your hands dirty, the creation. His passion for bread service is also evident in the practices Jim has adopted to set Seven Stars apart from other bread producers, both artisan and commercial. Since 2012, Seven Stars has sourced its grains from the Maine Grain Alliance, a nonprofit organization birthed in Skowhegan, Maine with the mission of preserving and promoting the use of locally-grown and milled grains as a means of connecting people and supporting sustainable growing techniques that promote food independence and provide local job opportunities. Seven Stars’ regional activism, alongside the work of nonprofits such as Farm Fresh RI, points to a growing trend amongst the New England community to grow local food systems that value environmental health and the quality of life of the farmers and eaters in the region. Jim and Lynn don’t cut corners on the quality details because they treat their customers like an extension of their family. “Our intention in opening the bakery was to be a bread bakery,” Lynn tells me, “but very quickly we learned that what people really wanted was a community spot. A place where they could gather with their friends and sit and have coffee.” Walk into any one of Seven Stars’ three locations today, and this changed intention is obvious. Large communal tables fill the space, offering seemingly endless prospects for the cultivation of neighborly gossip, and the front counters overflow with an assortment of pastries—sticky buns, cinnamon rolls, savory scones. Unlike most coffee shops, Seven Stars doesn’t supply its customers with wifi, so once you walk in the door you’re forced to focus on what’s really in front of you: the food and the people. 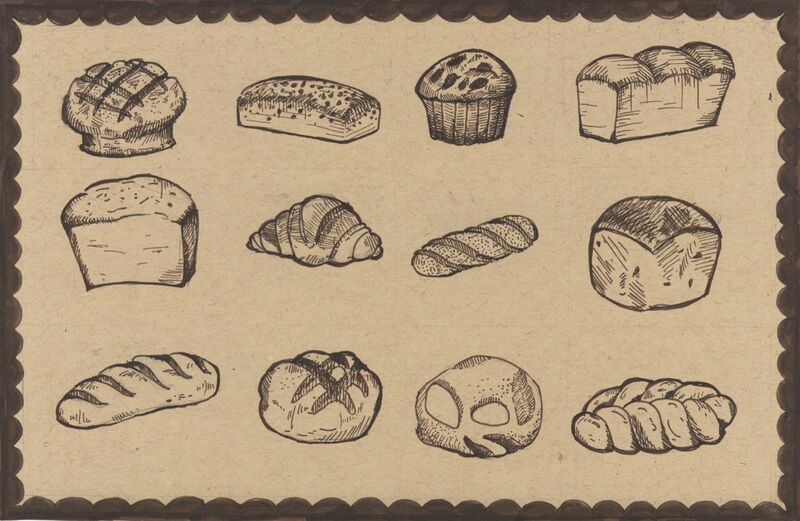 Behind all the pastries and coffee machines sit loaves of bread lined simply against the back wall—a stoic, if small, reminder that they are the foundation from which this community has grown. Had it not been for their initial interest in bread, Lynn and Jim may never have found the right medium for their deep love of fostering community. So if bread has the potential to be the beginning of this crossover between artisanal food and a wider community outreach, how much can you actually charge for it? It’s a tricky question, and there’s no definitive answer. By selling loaves that range from three to eight dollars, Jim and Lynn have made a commitment to provide a wide swath of the Providence community with good food that’s filling, organic, and delicious. But the bakery’s commitment to community doesn’t stop there. Since opening their doors, Seven Stars has recognized that it caters to a higher echelon of the Providence population and therefore has made it a core priority to donate all leftover products at the end of each day to local food shelters and pantries. Bread is of the body. In the biblical sense, it is quite physically the “body” of Christ. But even outside of that context, there is something deeply foundational about bread. It’s comforting to believe that there are cornerstones of our lives that have existed well before us and will continue to connect humanity long after our deaths. It certainly informs our memories. Asking Lynn about her taste memories, I was transported alongside her to a time when life felt full of beginnings. “I have this memory of one of my first bakery jobs. I had been cooking for a while and I got a job working at a bakery in New York. So I was relatively new at it and my job was as a bread mixer. I was there relatively late, and I was mixing and I remember this bread came out, it was this semolina bread. And this bread came out of the oven and I remember breaking it open and just smelling it and tasting it and feeling like this is why…” Lynn trails off as if, for a moment, she has been taken back to this New York bakery at that time in her life when everything was still a discovery and lay before her, outstretched and promising. Soon the phone rings and we are both brought back to our surroundings—the office and the sound of the milling next door. Lynn shakes her head and laughs, writing her story off as “just a goofy memory.” But there is more to it than that. For many, these indelible food memories come in snippets of time, sometimes whole years, defined by sensation—taste and smell and feeling. Bread has always been that first food and, luckily, with the help of bakers like Jim and Lynn, these sensory experiences of real, carefully-crafted food have the great possibility of becoming universally enjoyed. EMERSON TENNEY B’20 is eating bread right now.